It may come as a surprise to those who know me that even though I spend my winters in a house full of plants I only had one begonia going into winter this past year. It’s an Angel Wing begonia that is now branching out and almost as tall as my living room ceiling. It was a gift from a gardening friend a good 20 years ago or more, a tiny speckled-leaf plant that I often forgot to water because of where I placed it, in a corner where I had to crawl over a chair. As it grew, it increasingly got my attention, especially when it flowered mid-winter. Who can resist a plant that offers beauty in the middle of a stark Missouri winter landscape? I need to re-pot it this spring and do some trimming. I will wait until then so the cuttings will more easily root. Begonias are native South American plants and so easy to grow its easy to overlook them. 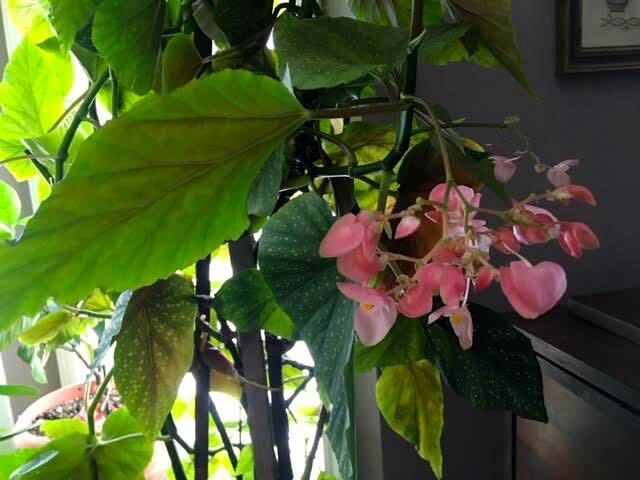 The Angel Wing begonia has taught me that the amount of flowering and leaf color depends on not only how well it is watered but the amount of light it gets. Pretty basic growing requirements for most plants, even indoor ones. Now that the plant is closer to a sunny window, I am getting more frequent flowering, which reminds me to water it. The leaves themselves are interesting. 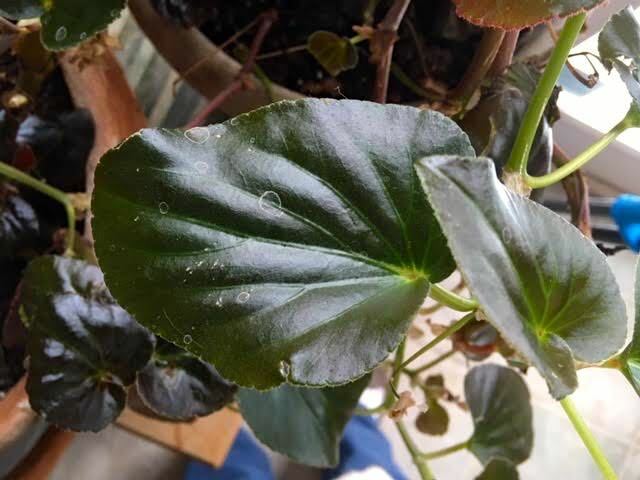 If you find a variety of begonia plants this spring, take a loot at their leaf shapes and colors, they’re almost as interesting as the flowers. Which brings me to the second begonias I now have living with me. These are their leaves. Look familiar? Frankly I didn’t know what they were when I found them discarded. There were no leaves on the stems. The stems themselves looked bedraggled after spending a few nights outside in below freezing temperatures. By all accounts, these plants should not be living. I wrapped the roots in repurposed bird seed bags and brought them home to sit in my den for a couple of days to warm up. The challenge I had was that I really didn’t have room for more plants inside but I was curious about what these were. Once potted with new soil, trimmed and watered and tucked into a southern-facing window, the salvaged begonias have started to bloom. Usually I see begonias in the spring that are either red or white flowers so this was a delightful surprise. The corral color contrasts nicely against the dark green leaves and the plants now seem none the worse for being tossed. I haven’t introduced the salvaged begonias to the Angel Wing begonias on the other side of the room yet but I think their flower colors are complimentary, both in that peachy corral range. And yes, I have a new appreciation for begonias. Even though I will still delight in having yellow roses like this vintage rose quilt brightening up my winters, begonias will have a special spot in my fall planning this year. These bedraggled plants should not have recovered. Their resiliency and beauty have now moved them up on my list of favorite winter plants!